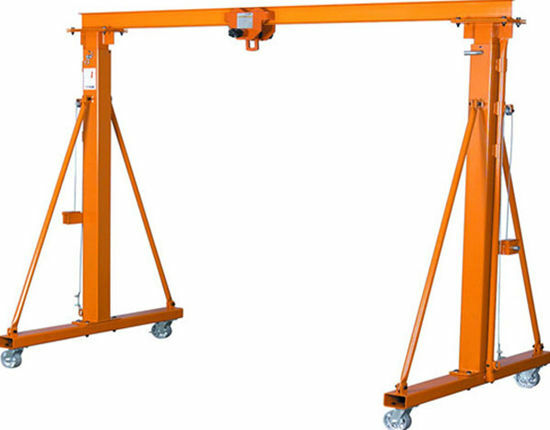 Although 1 ton gantry crane has a smaller device, the key components will not be less. We use reasonable structured operating equipment. We will maintain a safe and reliable, easy-to-maintain approach to the operation of this machine. Of course, it can also work stably in harsh environments. Under normal circumstances, we mainly put a ton of design in single beam. The main reason is that the double beam structure is not only a waste of material on the structure, but also cumbersome for loading and installation. We use advanced technology to rationally utilize a variety of production facilities, and focus on quality assurance in the processing of raw materials. Usually, it consists of a main beam and two brackets. In each leg side, it has a triangle bracket support. Triangle model physically is the most stability of the concept of our designer that is based on full range of development and research summary because customers not only trust our brand, but also always recognize our company’s products. In the future, for the development of the direction that is not only quality guarantee, but also the customer first. As long as the users choose our products, our group won’t let you down. The simple design and operation is not only the needs of customers, but also the concept that our company has been pursuing. With the rapid development of society, we must not only be at the forefront of the times, but also set our goals in the corresponding trends. 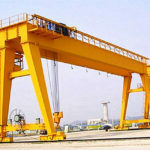 1 ton gantry cranes have been widely used in our lives. You can see them everywhere in the operation of the warehouse. 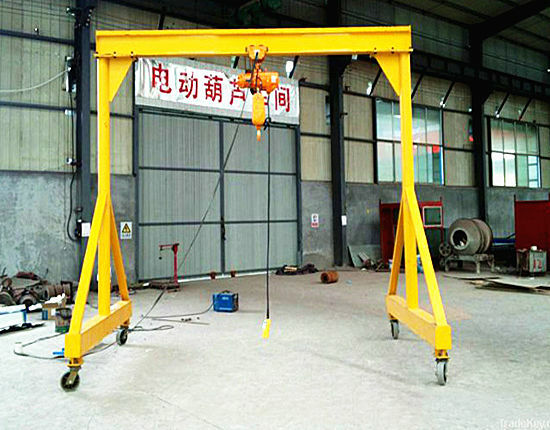 For example, if the workers frequently operate some action, the manufacturer can make full use of the gantry crane. This way not only solves a lot of manpower and financial resources, but also helps the boss to produce goods as soon as possible. Because at the same time, it must be the speed of the 1 ton gantry crane to take the upper hand. Now, this kind of production way has been integrated into our company. We must trust ourselves and believe in the development of our society. In addition, you will see the operation of the crane operator at the port or construction site. After all, everyone who has worked on it will know it. This product has the characteristics of simple structure, easy operation, convenient maintenance and high productivity. It is reliable in usage and able to work under very bad condition. The entire system adopts a mechanical mode. In addition, the above characteristics, our designers can choose manual operation or remote controlling according to different needs. Normally, large gantry cranes will also have a driver’s room controlling in the system. The design can not only expand the user’s field of vision, but also be more secure. 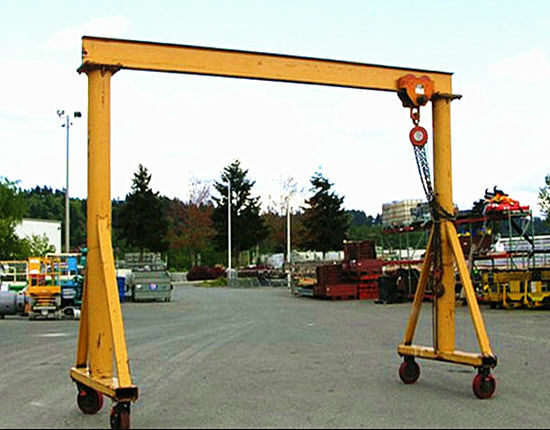 A small gantry crane or a one-ton gantry crane itself has a factor of low safety risk. Therefore, it is not necessary to have a driver’s cab. If you think there is something dangerous, then you can choose to control it remotely. Because of its smaller size, there are no obstacles blocking your sight. At present, for our company, we are innovating our products. We expect that we not only outperform other peers in quality, but also have other features to directly make our products put forward globalization. The development of globalization has made our relationship more friendly, and good products have to be shared by everyone. We have already gone out of the country market. Our products have been exported to more than 60 countries and regions. However, our pursuit has always been moving forward. We want our products to be better and more satisfying to our customers. In the system research, it is more practical and convenient. As a crane supplier, our responsibility is to do a good job of the product so that the customer satisfies with the products. Our company has always advocated passionate and dedicated work. For several decades of development and change, our philosophy has remained unchanged. This is why our team is so popular and why our company is getting better and better. So, after these years, we have our own unique insights on the supply of products. For example, supplying one ton gantry crane, our team must carefully verify the loading’s production and quality. Where is its error-prone condition and the strategy for solving it? This is a test for us and it is also our responsibility. In short, we must pay close attention to the product before it is transported to the customer. 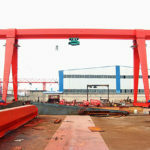 In the production of the gantry cranes, there are several major aspects of the operation, as well as the time that is sent to the customer. We will make a reasonable allocation of these issues. We not only make customers satisfy with our products, but also enjoy our services. We must be the one who knows the most about customer psychology and what is most important for users. In this industry, fair prices are also the biggest discounts we give our customers. The quality of the goods our company provides is excellent. You can choose a large number of orders. In a wide variety of products, you can also carefully select the most suitable product. Our team will also give reasonable advice according to the user’s requirements. If you are interested in our products or you want to learn more information about it, please contact us. After several decades of operation and export, our team has a lot of experience about this knowledge. Our staff will reply you as soon as possible. You can choose to email or call. In addition, if you have spare time, you can come to China, to visit our factory. 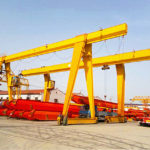 You will learn more detailed information on the process of gantry crane products.